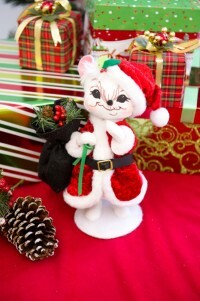 This is the Cosy Santa Mouse and stands at 8" high. Pair up with the Cosy Mrs Santa Mouse for a heart warming pair. Annalee figures are charming poseable figurines, and will bring a smile to your face every time you look at their adorable faces. An ideal Christmas decoration to add to your collection or send as a gift.